When you are travelling to or from Chicago and have a flight at Chicago Midway Airport, it helps to plan how you’ll be getting to and from the airport before the day of your trip. You have lots of options for airport transfers such as shared ride shuttle vans or taxis single riders or smaller parties and private vans, mini buses and motor coaches for larger groups of people travelling together. So whether you’ve got a group of 50 going to Wrigley Field or a group of 2 going to the Chicago Theatre, there’s a good option for you. Once you are done comparing the different transportation companies and vehicles and have your airport ride reserved you can relax and enjoy your trip. One of the most popular and well-known providers is GO Airport Express, which services the entire Chicago downtown and metro areas. You can get to your destination with professional drivers who know the business and how to service your needs. The Blue Van makes getting your SuperShuttle ride to and from Chicago Midway Airport even easier and more comfortable than ever. There’s no easier way to get to and from MDW. Whether you use Go Airport Express, Go Riteway, or Go Van Galder Bus you’ll be in good hands for your MDW airport transfer. MDW airport offers many options for airport ground transportation to get you around the Windy City. This is a busy city and getting your airport shuttle van or private town car booked ahead of time can make your trip go much more smoothly. Once you land at Chicago's Midway Airport getting to your destination is a breeze. You can book either curbside service or a meet and greet at the baggage claim. Either way you'll find this airport easy to navigate. Connecting with your airport shuttle at MDW is simple. After picking up your bags just go to the arrivals section. The shuttle pickup location is outside door number three. Your airport transportation provider may have a slightly different pickup procedure so make sure to check with them before your trip. Splitting a ride with other passengers going in the same general direction as you can make your shared ride shuttle van more affordable. Go Airport Express provides this service in the Chicago area. A private van provides you and your group with a non-stop ride from the airport to your destination. Whether you are going to Albany Park or Pullman this can be very convenient. Private sedan service is perfect for business travelers as well as individuals. You can book your private car with Luxury Chicago Limousine or Empire Limousine. Local personal drivers offer private car service but they are not employed by any transportation company. This is a good option if you are traveling to cities like Cicero or Stickney. Private SUVs can be booked with Blacklane or Windy City Limousine in Chicago. This is a good option if you are looking to get a few people from the airport to your hotel in Chicago. Many people prefer taking a taxicab to and from the airport. When you are in Chicago to see the sights like Millennium Park or Wrigley Field book your cab ahead of time. A stretched limousine can be a fun way to get you from the airport to neighborhoods like Avondale or Bucktown. No doubt about it, Chicago is a sports town. Got a group going to see the Chicago Bears, the Chicago Bulls or the Chicago Cubs play? Chartering a bus can get you all from the airport to the game with ease. 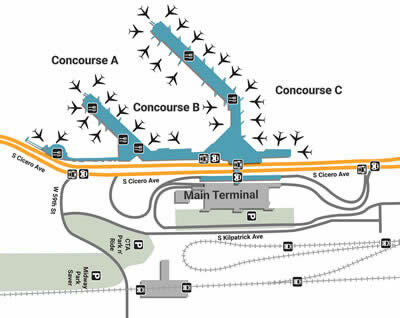 Make your way through the Concourses to the main terminal so you can get to your shuttle or parking space at MDW airport. MDW airport is served by shared ride shuttle companies such as Go Airport Express as well as private sedans rides that can transfer passengers back and forth from the airport with Blacklane and ExecuCar. Midway airport has many shuttle providers among a few that stand out are Continental Airport Shuttle and Omega Airport Shuttles are two ground transportation providers that provide airport transfer services to the downtown Chicago area. Ground transportation is also provided from Midway to the Donald E. Stephens Convention Center and McCormick Place Chicago Convention Center for those needing a ride from the airport directly to their trade show or conference. Stretch Limo Chicago provides a service that is reliable, clean, and affordable. A train station for the Orange line is located in the airport. Taxi service and car rentals are also available. Passengers arriving at MDW can book shared ride and private cars with providers such as Continental Airport Shuttle, which runs approximately every fifteen minutes, and Omega runs approximately every hour. Another transportation service is Coach USA Shuttles who provide service between Chicago-Midway and O’Hare Airport. You can find shuttle bus transfers for Chicago hotels near Midway anywhere from a quarter mile to five miles away. Some of the nearby hotels include the Hilton, Holiday Inn Express and the Marriott that have convenient access to Go Airport Express shuttles and private vehicles such as sedans and limos. Your trip to the Windy City is sure to be fun and full of excitement. Whether you want to visit the Lincoln Park Zoo, Wrigley Field or the Chicago History Museum the local visitor’s bureau will help you plan a great trip. Chicago Midway Airport is also located in Chicago but on it’s Southwest Side and convenient for those who need a shuttle ride for these Chicago surrounding neighborhoods, which are close by. Chicago Midway Airport was Chicago’s original airport but is now considered a secondary airport to Chicago O’Hare although it is certainly not lacking in traffic or the great reviews by travelers. The biggest attraction in the southwest side of Chicago is the Union Stock Yard Gate. But truth be told it can be a relaxing place for many visitors. Some of the places that Southwest side of Chicago can offer include the Balzekas Museum of Lithuanian, the Capital Cigar Store Inc. and the Chicago Blues Museum.